In the early morning hours of June 6, 1944, Americans received word that three years of concerted war efforts had finally culminated in D-day--military jargon for the undisclosed time of a planned British, American, and Canadian action. During the night, over 5,300 ships and 11,000 planes had crossed the English Channel and landed on the beaches of Normandy. The goal of every soldier and civilian involved in that effort was to drive the German military back to Berlin by opening a western front in Europe. General Dwight David Eisenhower was in command of the invasion, which was code-named Operation Overlord. Just months prior, the 1915 West Point graduate had led the invasion of French North Africa. The U.S. entered the World War II without the infrastructure and logistical support necessary to win. To overcome this deficit, Americans worked around the clock. Donald Nelson, chairman of the War Production Board from 1942-44, said, "The American war-production job was probably the greatest collective achievement of all time." Sixty million Americans mobilized to win the war. They held concerts and sold war bonds to raise money; rationed foodstuffs and gasoline; and salvaged scrap metal to transform it into machinery. Civilians produced everything from guns to socks for the men in the field -- 25 billion rounds of 30-caliber ammunition, over 88,000 tanks, and 460,000,000 pounds of cabbage. Every twenty-four hours, factory workers rolled five new B-26 bombers off of the assembly line. At the Higgins plant in New Orleans, the first fully-integrated work force in the U.S. produced 20,094 newly-conceived landing craft, 1,500 of which put troops ashore on D-Day. 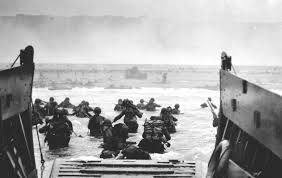 At about 3:00 a.m. on D-Day, on the four-meter swells of the English Channel, Allied troops transferred to those landing craft, some twelve miles off the French coast. British troops headed left toward Caen, the Americans right toward Utah and Omaha beaches nearer Cherbourg, and the Canadians to Juno Beach. For the Americans, Omaha was a near-suicide mission. First, a powerful undertow swept away lives and weapons; ten landing craft with twenty-six artillery guns and twenty-two of twenty-nine tanks were swamped. Then, they faced a maelstrom of bullets. Within ten minutes of landing every officer and sergeant of the 116th Regiment was dead or wounded. Yet, by 10:00 a.m., as Americans received the first news of D-Day, 300 men had struggled through mortar fire, across the body and equipment strewn beach, and up a bluff to attack the German defenses. 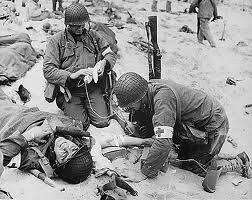 By nightfall, the Allies had a toehold on the continent, yet, on "Bloody Omaha" alone, 3,000 Americans lay dead. So as you go about your business today, say a silent "thank you" to the men who gave their lives on those far-away beaches sixty-nine years ago. They should never be forgotten for the sacrifice they made so that others might be free. God Bless them, every one! Thank you for taking the time to comment! It's so nice to know that there are others who cherish the men and women who have given so much that we might remain free. It saddens me that the children of today are not being taught our history in public schools. It is our responsibility to educate them and to make sure they know our God. i just hope it's not too late!